Our new nanny trainees were quiet as they entered the rooms and viewed their future charges for the first time. Director Li passed among the cribs, and as she explained the special care needed for each, she comforted the babies, held them, made small improvements before moving on. A baby who always lay on one side had developed eczema from lying in puddles of drool. Li asked the caregiver to find some cushions to support the baby's and instructed her to turn from one side to another every hour. Baby Wenting, born with congenital syphilis, her face red with painful looking sores, was the untouchable child. None of the caregivers wanted to lift her, even to bathe and change her clothes. And yet, whenever anyone would glance her way, Wenting smiled as if she were the luckiest little girl in the world. 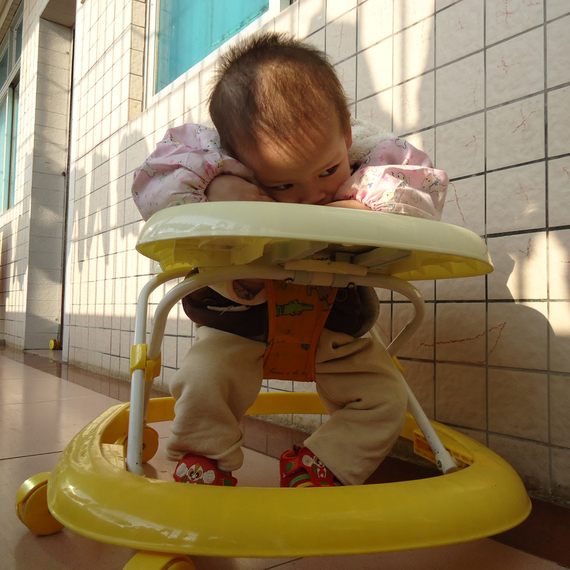 Against a wall, a tiny child sat slumped alone in a walker, her head on her tray. "This is Juanjuan," said Teacher Zhou, Li's training partner, as she crouched down beside the little girl. "We learned that she was to be adopted by a family from Spain but they brought her back. They said she was autistic because she never made eye contact or responded to her name or to toys. We can tell you that Juanjuan's situation is not uncommon. But we never use terms like 'autistic' or 'retarded' at Half the Sky. We know that every child has some potential and we learn special techniques to work with those who have great challenges. But those names just hold them back." She lightly touched the toddler's hair. Juanjuan pushed her face deeper into the walker tray, "Juanjuan will find her way," she said. Our training teams arrived early the next morning to prepare their classrooms, one for each of the three programs (Infant Nurture, Little Sisters Preschool, Youth Services) that would begin immediately. The assigned rooms were empty. The trainers cleaned the rooms and scrounged chairs and tables from around the orphanage. Most of the teacher, nanny and mentor candidates showed up promptly at nine. None of the invited orphanage staff showed up at all. "When I first came to Huazhou orphanage," said Teacher Zhou, "I felt the place was fine. The building is relatively new and there is a yard where children can play and a vegetable garden. The director was very warm and eager for our programs. But when I saw the actual condition of the children, how they were cared for, I had some worries. I had no doubt we could help, but how much we can really do depends on the staff we leave behind -- how open they are to change. By the next morning, when we began our training and not a single orphanage staff joined us, I knew we were not welcome." After introducing Half the Sky and the basics of the Infant Nurture Program, Trainer Li asked the trainees to select a partner. Once paired, she instructed them to share with those total strangers, something they like about each other. The women were embarrassed; these are not people who speak out much, and never to strangers. Li encouraged them, and within minutes, the trainees were hysterical with laughter. It wasn't much longer before these once timid, cautious women were playing team and trust-building games like veterans of Outward Bound. As laughter and yelps escaped from the infant nurture classroom, it was hard for the orphanage staff to resist. By lunch break, three workers had slipped into the back of the room. After lunch, seven more joined in. By the end of the week, women coming off night shift, instead of going home, were staying for class. Late in that first afternoon, when the nanny trainees returned to the nursery to begin to work with children, the atmosphere was transformed. And there was no doubt that every one of them love children. "If the caregivers don't have time to take good care of our new daughters and sons, we can do it!" one of them said. Trainers Li and Zhou watched the women carefully as they soothed and snuggled with their new charges. When the time came, they would make assignments, carefully matching each nanny to three babies. They would be especially careful in finding the women who would soon bring love for the first time into the lives of "untouchable" Wenting and "autistic" Juanjuan. In her new memoir, Wish You Happy Forever, Half the Sky Foundation's founder, Jenny Bowen, told the story of a failed attempt in 2002 to help children in Huazhou, a small orphanage in southern China. Today, Huazhou is becoming Half the Sky's 53rd children's center in China. NEXT: Young teachers enter a world they never knew existed.